In today’s blog post, we are discussing the fielding stance, because the stance is very critical. It’s a set-up, it’s a ready position. It’s very similar to volleyball, basketball, and some of their skills. It needs to be a strong athletic stance. Volleyball and receiving the serve will be down, waiting for it. Basketball, the athlete is in their guarding position in a strong athletic stance. And we often use a very strong athletic stance in hitting. Hitting, our feet may be a little closer together, but at the same time we have a nice strong athletic stance. The width of your stance needs to be one that is close enough so that you move quickly to either side. A good judge is certainly the shoulders – shoulder width. If you get your feet too wide, it’s really hard to move quick. And in the infield, quickness is important. That acceleration, that first step is very, very important. You want to take it as quickly as possible. So get in a comfortable stance that is going to allow you to react quickly. If your stance gets in too tight and narrow, then what you have is people not getting down on the ball. You also can’t move in very well running in this position. So again, you want to get them out about shoulder-width apart. You want to keep your feet pretty much square to your target. The ball is your target, coming and approaching you. You want to stay in this position. Or if you’re playing third base, home plate where the batter is squared, centerfield, and if you should be an outfielder, first base. You’re always going to be square to your target and your target is going to be the ball coming off the bat. If you feel that you have a little weakness going to the side, you may feel that you wish to open your stance. But what happens is once you open the stance, you close the stance at the same time. You can’t have both. And when that happens, you can move very quickly to one side, but if the ball comes to the other side, you’ll be very slow. You’ll have to take an extra drop step back , rather than just a pivot and go. So you want to be very careful about opening and closing stances, because you’ll have both. You’ll open one side, but you’ll close the other side. So rather than cheating, so to speak, work on both sides. You can move quickly to the left and you can move quickly to the right. In terms of your feet, we want to get down in a flex position, drop your seat down, and you should notice the knees are just a little bit in front. Three or four inches in front of the toe. Now, a third baseman is going to be a little lower to the ground. (A shortstop, and a middle inner fielder such as second, would be up a little higher.) The hands are out in front and the athlete is going to track the ball in. She’s going to want to field the ball out in front rather than sliding it back under. If it slides back under her, she has to drop her head more and she loses part of the tracking. So we want to keep it out from under the body for two reasons. One, for tracking; she loses sight of it. The ball will move much more quickly than your head will move. The other reason is, if you get the ball down in between your feet, it really hampers you in trying to field the ball clean, because you’re moving your feet. You’re trying to bring the ball, and trying to move your feet at the same time. So again, we want to field the ball out in front. The other thing we want to do is we want to field the ball off center. Rather than having the ball come in and lining it up directly in the center, she’s going to line it up on the side. This way, if the ball should take a last bounce to the left, she can very easily go with it. This makes fielding the ball much easier. You want to avoid any position that makes you end up in the back hand position. 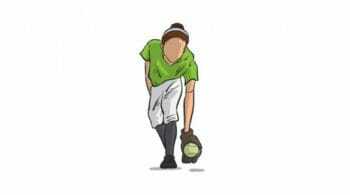 This takes time to whip that glove around, and get into the proper position to lead you into the throw. So line up the ball off center to your glove hand so you can continue to use your forehand rather than the backhand. One other thing I want to mention is, the further down you get, the flatter your back gets. So we’ll start in the shortstop position. The back is semi-flat. The further down she gets, her back flattens. So now we almost have a table. Also, in the fielding position her head, her forehead, her nose will be over the ball. Pointed straight down to the ball. A quick check for your athletes: Line them up on a line, get them all in a fielding position. If you can see the top of her head, she’s in a good head position for fielding. If that head comes up, and she’s looking out so that you can see her forehead and you can also see her nose, and you don’t want to do that. The nose and the forehead needs to be pointed to the ball. These are some very, very good basic set-up positions that you really need to work with your athletes on. Just don’t assume they’re going to do them correctly. Take the time, set them up, roll them a ball. And that’s the next thing we’re going to do is we’re going to roll a ball. And the athlete will simply approach it. She’s down, she’s ready, and one other point I might mention is sometimes they’ll kind of come up. 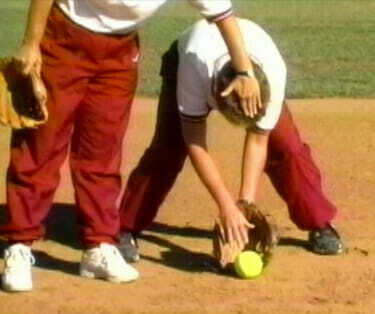 Don’t roll them a ball, don’t hit them a ball until they’re down in a ready position. So I’ll say ready, she’s down in position, and then she gets the ball. And she moves to it, with the head in. She brings the ball into her stomach. And she has nice soft hands. You want to consider this ball an egg. And we want to cradle it, we don’t want to scramble it. So she softly brings it into her body. Once she has the ball, then she’s going to look up to the target. We don’t want to stay down there too long. She brings it in, and up she looks to her target. We’re then going into a good throwing position. Our feet are in a good throwing position. When she steps to release it, she’ll step right to her target. A couple of things that you might have to do when working with finding your target, is some of your athletes may not keep their heads down long enough when they are stating out. They come up immediately. And one thing you’ll notice is that when she comes up, she will stiffen her arms. Her head comes up and she’s not going to see the ball, and she also stiffens her arms. Remember we want to be nice and soft. You do that by rounding the shoulders. That get the arms down, but the minute she lifts her head, it automatically pulls everything up. 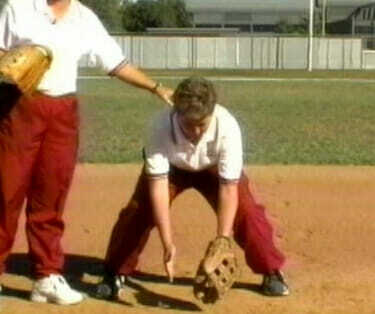 And that basically is the position without doing a lot of moving left and right, and good technique in fielding. 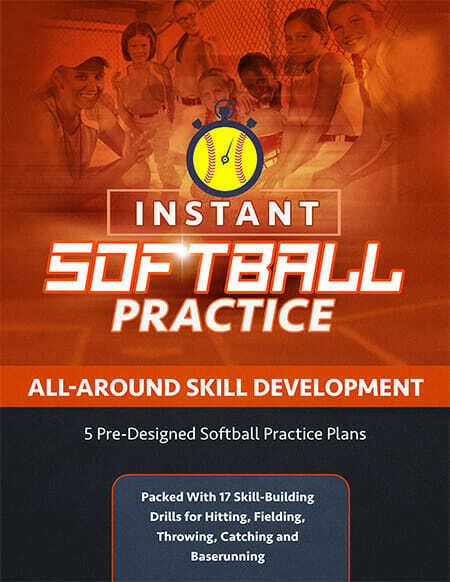 For more great softball fielding tips and techniques, be sure to check out my “5 Free Softball Coaching Videos from 11 Time NCAA Champ Sue Enquist”! 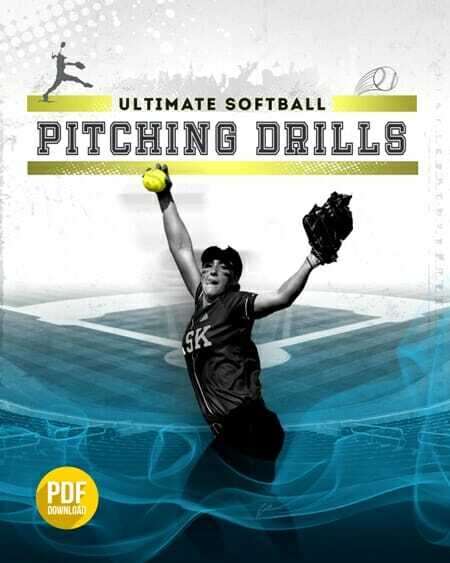 Sue will take you through softball fielding and defense, as well as hitting mechanics and hitting drill practice plans, baserunning, field progressions and pitching! And don’t forget to Become a Fan on Facebook, where I will share more great softball fielding ideas and suggestions, and where you can talk to other coaches and players about favorite softball defense practices!